*Currently open to US shops. 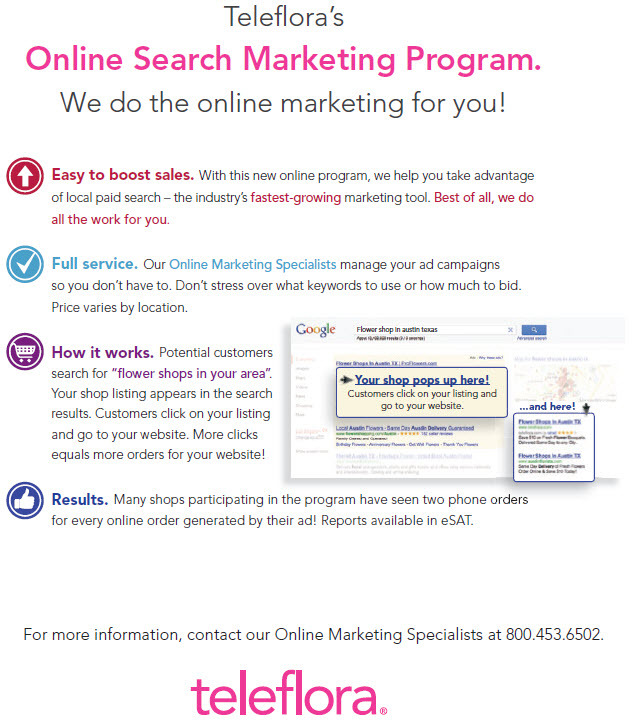 The Online Search Marketing Program is an easy, affordable way to reach online shoppers seeking local services. Shop ads are placed on Google's search results page, where nearly 3 billion searches for local goods and services are conducted every month. That's a lot of potential new customers! We’ve tested paid search ads in a number of markets, both large and small, and found that they increased the number of online and phone orders significantly across all markets. Even for shops that rank highly in organic search results, paid search ads provide an extra boost in orders. No need to research and shop around for the best vendor: Teleflora knows how to run successful floral paid search campaigns and is sharing its expertise with member shops. Track your campaign performance using eSAT. Program enrollment includes support from our Online Search Specialists, who can help explain and improve your shop’s campaigns. Orders from paid search ads are 100% orders, because they go through your website or phone. Fees are a fraction of what you would pay a vendor for comparable services. Participating shops have seen increased web and phone orders within the first month. For more information, call our Online Search Specialists at 800.453.6502 or email at onlinemarketing@teleflora.com.